What can I say really? I mean you eat your Sunday Roast, eat something smothered in custard and the fall asleep in front the TV. 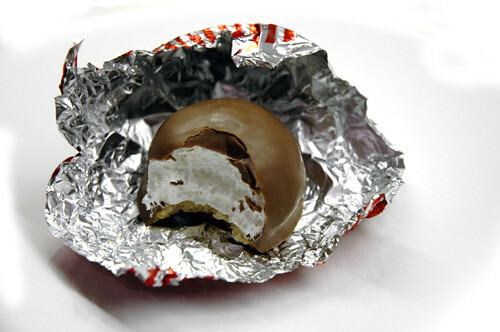 Later in the evening, some cheese on toast and a Tunnock's Tea Cake. These little Scottish beauties are a stunning mixture of marshmallow and chocolate and frankly with a mug of tea there is nothing better. On a Sunday, with the new Richard Attenborough documentary on the telly and that slightly sleepy feeling hitting you after a day's heavy eating you need a little sugary hit to get yourself in the mood for Match of The Day. Sweet. looks gorgeous... utterly sinful but what the heck! you've made me all home sick now. I wonder if you can get these in sydney? have you tried the dark chocolate variety? i keep meaning to pick up a pack to try. dark chocolate makes anything automatically better, in my opinion. Keiko, thanks for pointing out the care and attention to detail that I pride myself on this site! D'oh! this looks like a much classier version of a favorite in New York and New Jersey - the mallomar!